“Sixteen shots and a cover up!” was the cry of protestors and activists as the hidden video of a 2014 police shooting of a Black teenager in Chicago was made public. Finally, Chicago police officer Jason Van Dyke was found guilty of second-degree murder Oct. 5 for pumping those bullets into 17-year-old Laquan McDonald. And, for the first time in about 50 years, a Chicago police officer was found guilty of killing someone while on duty. Mr. Van Dyke was also found guilty of 16 counts of aggravated battery, one for each of the shots he fired that fateful night. He kept firing even as the boy lay on the ground. Despite the presence of other officers on scene the night of the murder and an officer with a taser on the way, officer Van Dyke stepped forward and fired his service weapon until it was empty. Jurors who were interviewed following the verdict said those shots helped convince them that Mr. Van Dyke had overstepped what was right and lawful. They also saw his sometimes tearful testimony as contrived and false. It was a measure of justice largely made possible by the efforts of an independent journalist, Jamie Kalven, an activist, Will Calloway, and University of Chicago Law School professor Craig Futterman, who led a successful Illinois Freedom of Information Act request for the release of police dashcam footage showing the horrific shooting. It took 13 months for the video to be released. The video only came out after a contentious mayoral election victory by Rahm Emmanuel and quick payment of a multi-million dollar settlement to Laquan’s family. Before the video was public, it was seen by some officials and police authorities. The mayor, the then-police chief Garry McCarthy, police higher ups and then-District Attorney Anita Alvarez were harshly criticized. Protests rocked the city alongside calls for the removal of the mayor, the police chief and the district attorney. The police chief was fired. The district attorney lost a bid for re-election. Mayor Emmanuel is not running for another term in office. So, the activism and the organizing, the shutdowns of streets and thoroughfares, and challenging authority resulted in a major conviction. It wasn’t apathy, prayer without work or walking away from the uphill road that changed reality. It was a willingness to confront wrong and a determination to press a system that has rarely been responsive to respond. It meant going against critics, naysayers, doubters and those who wanted quiet in the face of a brutal murder. It meant a willingness to fight and a campaign that spread from Chicago to cities across the country. It was disheartening to hear the Rev. Marvin Hunter, the great uncle of Laquan McDonald, share Oct. 5 how Black civil rights lawyers and others he approached refused to accept the challenge. They felt there was no way a case against a Chicago cop could be won, he said, during a press conference with Laquan’s family members standing with him. It’s shameful that those who had the skill and the knowledge didn’t have the courage to step forward. We will never exact any justice from a racist, recalcitrant system without a willingness to challenge the system. What choice do we have? Should we just lay down in the street and do nothing? Even as we believe separation is the true and divine solution to the problem of Black and White and our slavery, suffering and death in America, we must never allow the oppressor to believe his mistreatment and murder of us is acceptable. We should never be such cowards, especially today when we believe God Himself is on the side of the Black Man and Woman. 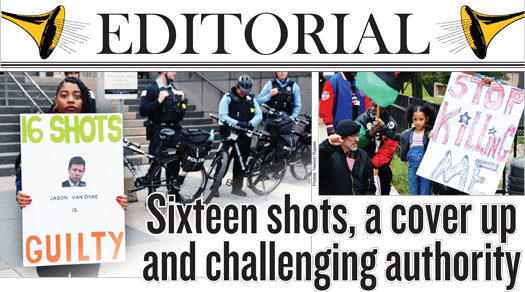 Even before darkness fell, the mainstream media Oct. 5 was seeking to pacify Chicago’s police force. There was talk of how the decision would impact a police department with a history of corruption, terror, murder and racism. Instead of focusing on the criminal act of an officer, found guilty in a court of law, the White-owned media tried to project how the decision ill-affected cops. It doesn’t. It does not impact police who engage in lawful behavior; it does challenge the notion that policing must occur at all costs and the Black community has no rights police are bound to respect. Not even the right to life itself. It has been 50 years since a cop was convicted on the job for killing someone. Yet the city has seen numerous Black deaths and paid out millions of dollars in settlements for police abuses, misconduct and deaths. Then there are Chicago police officers Thomas Gaffney and Joseph Walsh and Det. David March, who are charged with conspiracy, misconduct and obstruction of justice for filing false reports in the Van Dyke case. Other unnamed officers at the scene or who conducted the investigation are believed to have joined in the lying and conspiracy to protect their brother-in-blue. There was talk of a purported threat to the children of the officer on trial as justification for his lateness in coming to court. But Blacks in this city have to deal with the suggested threat of police assaults daily and actual threats from officers on a regular basis. Who is the victim here? Is it Laquan McDonald, who is dead, shot to death Oct. 14, 2014, and a Black community under police occupation or a convicted murderer who happened to wear a blue uniform? Jason Van Dyke isn’t a noble police officer, he is a cold-blooded killer. Any attempt to make him other than that only sets the stage for the continued persecution and execution of Black people.